Critics can be particularly rough on horror pictures. It's so easy -- too easy, sometimes -- to make these spook-shows sound risible and preposterous in synopsis, especially once you remove them from the darkness of the theater and examine them them in the harsh light of black and white newsprint (or monitor pixels). But the horror films I like best are not the abundantly bloody shockers critics love to loathe (though George Romero's extravagantly gory Grand Guignol "Dawn of the Dead" (1979) is a treasured favorite), but the ones that are the most atmospheric and creepy -- that suggest far more than they depict. In his playful rumination on all-things-horrific, Danse Macabre, Stephen King described the self-defeating psychological mechanism that's built into our response to most horror movies, where veiled threats must eventually be made more-or-less explicit. For example: after mounting apprehension about the fear we are about to confront, somebody eventually has to respond to the scratching sound at the door and throw it open -- only to reveal, before our terrified eyes ... a ten-foot-bug! And no sooner do we register that fear -- hairs standing erect on our necks, gooseflesh crawling up our arms -- than we begin assessing and processing it; in an instant, an equal-and-opposite reaction sets in, tinged with disappointment: "Oh," we think. "A ten-foot bug. That I can deal with. I was afraid it was going to be a hundred-foot bug!" No wonder so many horror movies carry with them a slight feeling of deflation the moment that rush of "I survived it!" adrenalin begins to dissipate. The most compelling horror films, for me, are are not just about bugs, no matter what the scale, but movies that work both sides of our brains simultaneously. They're about something besides flesh-and-blood monsters or zombies or things that go slash in the night. Every horror movie is about mortality, the fear of death in all its forms, but the best ones delve deeper into thes universal terrors. The aforementioned "Dawn of the Dead," for example, which sees its suburban zombies, attracted to the mall like undead moths to an infernal flame, as a commentary on the nature of another deep, psychological hedge against the fear of death: acquisitiveness, capitalism, consumerism as a futile way of staving off the inevitable (or at least fooling yourself, on some level, into feeling you are). In philosophical terms: "I buy, therefore I am." This is precisely the dimension missing from the even gorier, but far less scary (and funny), 2004 non-Romero remake. What follows is a list of four horror films of which I am quite fond (that is, scared) -- films that give me shivers on the visceral and intellectual levels at the same time. The majority of mainstream critics loathed, ridiculed, or scoffed at them, one way or another, when they were first released (hey, they did the same to "Psycho," too), but which have either grown in critical stature over the years or are due for a critical re-assessment. Three of the four are, I submit, neglected masterworks. And they're all now available on DVD, too. So, if you appreciate horror films with higher aspirations, give these movies a chance. At the very worst you'll have an off-the-beaten-path and agree with the conventional wisdom of the time in which they were released; but you might just discover something neglected that retains the power to really opens your eyes. (David Cronenberg, 1979) Cronenberg's third feature is one of his most fully realised -- a chilly and, well, brooding piece whose somber, atmospheric tone prefigures "Dead Ringers," "Naked Lunch," and "Crash (1997). Yes, it's a long-underrated masterpiece -- and I was thrilled that Canadian director Don McKellar ("Last Night") gave a special presentation of "The Brood" at the 2004 Toronto International Film Festival. I myself did a similar presentation of "The Brood" at the American Film Institute back in 1988, and for the last ten years I've been trying to get Leonard Maltin to change the BOMB rating assigned to it in his Move and Video Guide -- but, so far, to no avail. (Reconsider, Leonard!) 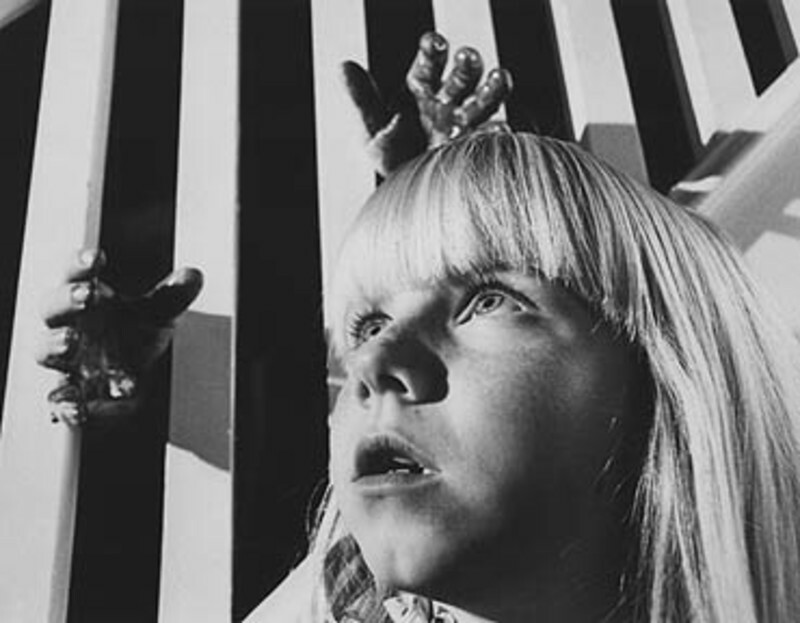 Even Roger Ebert, an admirer of Cronenberg's who gave the director's early "Shivers" (aka "They Came From Within") a positive review, wrote of the misunderstood "The Brood" in 1979: "Now here's a particularly nasty little number. "The Brood" is an el sleazo exploitation film, camouflaged by the presence of several well-known stars but guaranteed to nauseate you all the same...." He even called it "boring"! But forget, for a moment, that "The Brood" is a genre piece; it's a deeply serious film about the terrible legacy parents may leave their children, the passing down of physical and psychological damage from one generation to the next. Wounds to the psyche (from divorce and other traumas experienced by the kids) emerge in later years as physiological symptoms: alcoholism, depression, neurological skin conditions, cancers. Cronenberg reputedly wrote it in the middle of his own bitter divorce and child custody battle and, like the emotionally fractured nuclear mommy Nola Carveth (played by Samantha Eggar) here, he gave shape to his own nearly inexpressible rage through his filmmaking. Horror movies don't get more personal, more intimate than this one. "The Brood" begins as an inspired satire of 1970s psychological "therapy" cults, with best-selliing author (The Shape of Rage) and new-age therapist Dr. Hal Raglan (Oliver Reed) treating, through role-playing, a patient who was emotionally abused by his father, the man-child's repressed agony manifesting itself in the form of skin lesions. At the wonderfully named "Institute for Psychoplasmics," patients are encouraged to express their innermost anguish and unexpressed fury in ways that (to borrow a phrase from Cronenberg's comparably brilliant "Videodrome") are "made flesh." In a nod to Nicolas Roeg's great "Don't Look Now" (also about parents, children, and family grief), Nola literally gives birth to "children of rage" who act out her long-stifled anger with her estranged parents (also divorced), her ex-husband, and perhaps even her young daughter. To quote from McKellar's notes in the 2004 Toronto programme: “'The Brood' got under my skin (to put it Cronenberg-ianly) not just because it exposed me to an illicit world of transgressive, exhilarating cinema, but because it taught me the secret of great horror – allegory. It showed me how someone could transform personal pain – and the subject was clearly autobiographical – into imaginative, grotesque, liberating metaphor. In fact that’s pretty much the plot of the film: unresolved emotions from an ugly divorce give birth, quite literally, to terrifying manifestations. (Roman Polanski, 1976) Coming on the heels of "Chinatown" -- that rarest of rarities: a mainstream masterpiece that's as close as the movies ever get to perfection -- it's not hard to understand why Roman Polanski's "The Tenant" was dismissed as a grotesque disaster. Even Roger Ebert wrote: "'The Tenant''s not merely bad -- it's an embarrassment." Well, it's certainly queasily embarrassing at times -- since it chronicles the Kafkaesque humiliation and utter dissolution of a naive and timid creature (played by Polanski himself). I think it's also a masterpiece -- though unlike "Chinatown" it's a deliberately (and deliciously) awkward and uncomfortable one. The most Polish of Polanski's features (even the only one actually shot in Poland, his debut "Knife in the Water"), "The Tenant" is steeped in dank, Eastern European melancholy and absurdity -- mostly set in and around the carcass of a once-grand Paris apartment house that has wilted and gone to seed, gorgeously photographed by Sven Nykvist in various shades of mildew and decay. The dizzying, spiraling opening shot -- catching shadows and glimpsed reflections of spooky, furtive figures in the darkened, lace-curtained windows facing the building's interior courtyard as it descends to the pavement (figuratively tracing the trajectory of the movie's title character -- bears comparison to the ledgendariy serpentine camerawork at the beginning of "Touch of Evil" and "The Player." The title character is a milky little man named Monsieur Trelovsky, a relative of Kafka's Joseph K. (as well as the buggy protagonist of "The Metamorphosis") and Dostoyevsky's Underground Man, cowed and bullied at every turn by everyone he encounters -- not just authority figures but waiters, co-workers, fellow tenants, even total strangers -- who moves into the apartment of a woman who has recently thrown herself out of the window. The flat has all the charm of a rotting corpse, with "new" plumbing that rattles and groans like a body in its death throes, and a convenient view of the toilet across the courtyard/abyss (yes, this is a major plumbing movie), which is down and around the corridor, and which always seems to be occupied by strange people just ... staring -- sometimes directly back at him. What happens is, the tenant (being none too solid a personality himself) inevitably but unwittingly starts to take on characteristics of the apartment's previous occupant. Indeed, the stifling atmosphere -- any little thing he does seems to generate complaints from the neighbors -- seems to give him little room to move. It's as if everyone around him has cast him in this role, and he is helpless to assert his own identity. (One delicious touch is so subtle you almost miss it: M. Trelovsky orders a martini in a cafe, but when he returns to his table and starts sipping his drink, it's brown and in a tall glass. He doesn't raise a word of complaint, just accepts reality on anyone else's terms but his own.) The movie is cut from the same personality-unravelling fabric as Bergman's "Persona" and Altman's "Three Women," and similarly explores confounding questions of individuality and identity. "At what precise mjoment does an individual stop being who he thinks he is? " wonders M. Trelovsky, hypothesizing about the meaning of various forms of dismemberment, including (literally) losing his head. "If you cut off my head, what do I say: me and my head or me and my body? What right does my head have to call itself 'me.' " The "tenant" of the title is really what we might call a personality or a soul. So is M. Trelovsky inhabiting his apartment, or is it (or its previous occupant) inhabiting him? The peculiar dubbing job into American -- not English, American -- actually adds to the disconcerting sense of dislocation. The climax -- with M. Trelovsky in drag, bloodied and broken, dragging himself up the spiral stairs as if stuck in a Sisyphean suicide-loop (how's that for a nihilistic metaphor for existence?) -- is indeed horrifically funny. "The Tenant" is a comedy as much as it is a horror film, a paranoiac giggle in the manner of Kafka and Dostoyevsky -- and one that might also remind you of the Coen brothers' "Barton Fink" (which was inspired by "The Tenant," and which won the 1991 Palme d'Or at Cannes from a jury headed by Roman Polanski, a quarter century after "The Tenant" itself met a disastrous reception at the same festival). Wonder what was in that box Barton carries out of the ruins of the Hotel Earle at the end of "Barrton Fink"? If you've seen "The Tenant" you will have little doubt about its contents... P.S. Frequent collaborators Polanski and Gerard Brach based their screenplay for "The Tenant" on a novel by Roland Torpor, whom movie fans will remember as the insane, bug-eating Renfield in Werner Herzog's "Nosferatu." Other recommended Polanski horror films: "Repulsion," "Rosemary's Baby," "Macbeth," and the gorgeously goofy horror-comedy "The Fearless Vampire Killers." (Neil Jordan, 1999) A partially failed movie, but a flawed masterpiece nonetheless. It was a scandal the way this beautiful, haunting, visionary film was dismissed by the critics and dumped by DreamWorks. "In Dreams" strikes me -- then and now -- as a far more adventurous, exciting, challenging, and poetic film that Jordan's big mainstream horror hit, "Interview with the Vampire." The opening credits sequence -- as a ghost town is submerged beneath the waters of a man-made reservoir, a figurative valley of tears -- sets a dreamlike tone that is, well, breathtaking as well as eerie. No, more than "eerie"-- this is horror at its most primal and hallucinogenic, in the region of "Night of the Hunter" and "Don't Look Now," Bernard Rose's feverish "Paperhouse" and Jordan's own magnificent "The Company of Wolves," and the silent classics "Nosferatu" and "The Cabinet of Dr. Caligari." Annette Bening (in her most daring and wrenching performance; she's astonishing, fearless, heartbreaking) plays an illustator of children's books (including a volume of Grimm's fairy tales), who is haunted -- tormented, tortured -- by dreams (premonitions or memories-once-removed?) of a real-life child killer. But it's worse than that; she begins to believe the killer himself has actually become a squatter in some ramshackle, abandoned corner of her own brain. Unfolding with the relentless illogic of dreams, the film abounds with core- imagery that is both biblical and fairy tale like -- water and blood, red apples ripe and rotten, forests Edenic and primieval, innocent fairies and vile, corrupted beasts, "Snow White" and "Little Red Riding Hood" (which Jordan had previously revisited in "The Company of Wolves"). And that image dearest to my heart (or maybe another organ) -- plumbing as a metaphor for the subconscious. The movie traces a descent into madness and its mirror-image, a fall from grace, with harrowing artistry, frequently achieving effects I can only describe as awesome: children dressed as fairies for an outdoor evening school performance of "Sleeping Beauty," flittering through a forest like fireflies; a child standing on the steeple of a submerged church; a car plunging into a lake -- seen from inside the vehicle; a sink clogged with apples disgorging its pulpy waste.... Yes, the last 15 minutes or so -- the eventual confrontation with the killer, Robert Downey Jr.'s flailing performance, and the obligatory-feeling "Carrie"-esque epilogue are a letdown from the mastery of the first 90 minutes. But this -- of all movies -- is not one to be taken literally. Even near the end, when things seem to falling into studio-formula lockstep, Jordan's autumnal imagery, of a fallen world in the throes of decomposition, sustains its chilling spell. Other recommended Neil Jordan horror films: "The Company of Wolves," "Interview With the Vampire," and (stretching the definition of the genre a bit) "The Butcher Boy." Jordan is well-known as the director of "The Crying Game," "Mona Lisa," "The Miracle," "Michael Collins," "The Good Thief," and others. (John Carpenter, 1987) This one is not in the same league as the others here, but I still feel it's underappreciated -- and ahead of its time. Ebert writes (in a two-star review): "When we're threatened with Armageddon, we expect more than people hitting each other over the head with two-by-fours.... Call me an optimist, but I believe Absolute Evil should somehow be worse than that" -- and, well, I don't disagree. He's absolutely right that the set-up is the best part (isn't that the case with most horror movies, before the inevitable revelation of the ten-foot bug?) and he admits that it has some nifty elements. But what makes me goose-pimply about "Prince of Darkness" is its goofy-but-ingenious central conceit and its truly Surrealistic imagery, some of which could have sprouted out of Bunuel and Dali's "Un Chien Andalou." So, here's the set-up: An ancient cylinder is discovered in a subterranean chamber beneath an urban church that contains a churning, swirling greenish plasma-like solution of ... Something Bad. And it's gaining in mass and energy at an alarming rate. That's right: It's Pandora's Box, and what it contains is Badness Incarnate. But there's more: The movie employs vague notions of quantum physics to posit a metaphor for "evil." The idea is that the chaos that exists on the scale of quarks actually represents Evil -- a force of disorder and destruction that underlies , and could threaten to upend, our stable, continguous, common perception of matter, space, and time. ("Say goodbye to classical reality," lectures physics professor Edward Birack [Victor Wong] before the protracted opening credits are even over, "because our logic collapses on the subatomic level ... into ghosts and shadows.") Wait, wait, we aren't done yet; this is where it gets really ingenious: Turns out, the priests of the early Catholic church somehow discovered (through the appearance of Satan himself -- and, if I recall correctly, even Satan's dad) that Evil was an actual, physical force in the world. But the Pope decided to hush it up (and here I confess that I am prone to love yarns involving papal conspiracies, especially in horror films) because the newly formed Church angled to use the concept of "evil" as a manmade failing to its own advantage, selling Christ as the antidote to man's innate imperfection, which the early Church recruiters advertised as "Original Sin." It's the oldest trick in the book (I'm reminded of the horror movie web site that recommended Mel Gibson's "The Passion of the Christ" as a four-star gore-fest that would help horror fans to a deeper understanding of Christian occult movies like "The Exorcist" and "The Omen.") "Prince of Darkness" is the Anti-Deepak Chopra; instead of using squishy pop physics to "prove" spirituality, it uses the same sub-atomic quarks and quirks to demonstrate the power of evil. And then there's this: The nightmarish visuals of "Prince of Darkness" are not as downright bone-chilling as, say, the stuff in Wes Craven's original "A Nightmare of Elm Street," but they're comparably imaginative and memorable -- images that seem to rise up out of the chasms of the subconscious: worms that writhe in clumps on window panes; a crucified pigeon; a sinister liquid that pools ... on the ceiling, and spews into the eye-sockets, nose, and mouth of a sleeping woman; hazy, haunting "dreams" that are really video transmissions from Beyond, broadcast directly to the characters' sleeping subconsciousnesses; a talking corpse crawling with insects as it crumbles into pieces... With its wall-to-wall throbbing electronic score escalating the tension, "Prince of Darkness" plays like a synthesized symphony for the devil ... in the tiniest details, the most minute and invisible cracks and crevices of reality. "Prince of Darkness" preceded Carpenter's most political horror film, the absolutely terrific (and better-reviewed) "They Live!" -- which Carpenter described at the time as being about "rich Reagan Republicans from outer space" who invade America by stealth and keep citizens subdued and subjugated with ubiquitous subliminal advertisements for conformity -- through television broadcasts and other hidden messages in Los Angeles billboards, such as "OBEY AUTHORITY" and "MARRY AND REPRODUCE." Something you might find particularly profocative during the 2004 election season. PS The screenplay is credited to "Martin Quatermass" (actually Carpenter), an hommage to tProfessor Quatermass, he British hero of a series of horror/science fiction films in the 1950s - 1970s. Other recommended Carpenter horror films: "Halloween," "The Fog," "Escape from New York," "Christine," and, especially, "They Live!"